Government used ‘misleading’ figures to claim homelessness halved – Statistics authority warns Government claims to have halved homelessness are based on the government’s very narrow definition of terms. George Osborne rebuked for ‘no cuts in police budgets’ claim – The Chancellor claimed he would provide “real-terms protection” but forces face £160m funding cut, statistics watchdog rules. Sir Andrew Dilnot, the chair of the UK Statistics Authority, ruled that despite Osborne’s claim to be providing “real-terms protection” for the police, forces actually faced a £160m real-terms cut in their Whitehall funding in 2015-16 and 2016-17. A House of Commons analysis estimated that the £160m cut was equal to the salaries of 3,200 police officers over the two years. David Cameron rebuked by statistics watchdog over national debt claims – The PM said the government was ‘paying down Britain’s debts’ in a political broadcast, even though the debt is actually rising. “Now that his false claims have been exposed, it’s time the prime minister stopped deliberately misleading people about his economic record” – Rachel Reeves. Finally Exposed! The Deficit Myth! So, David Cameron When Are You Going to Apologise? David Cameron rebuked over austerity claims – Cameron has been corrected by the Treasury’s own forecaster over claims that cuts in public spending are not reducing economic growth. The Office for Budget Responsibility told the Prime Minister that it does believe that cutting public spending will reduce economic growth in the short term. Robert Chote, the head of the OBR, contradicted a claim Cameron made in a speech about the economy, in which the Prime Minister said the forecaster does not believe cuts are reducing growth. In fact, as Mr Chote wrote, the OBR believes that cuts in spending and increases in tax will depress economic activity, meaning lower growth. OBR head rebukes Osborne: the UK was never at risk of bankruptcy. Office for Budget Responsibility chief Robert Chote dismisses the Conservative “danger of insolvency” claim. It was, of course, nonsense. *Please note the original link to the New Statesman article seems to have curiously vanished. So here is a cached link to the same article: OBR head rebukes Osborne: the UK was never at risk of bankruptcy. Cameron was attempting to show in an interview for the Daily Telegraph that the government had reversed a situation in its first few years of office when he claimed most new jobs were taken by migrant workers. The interview was widely interpreted as an attempt to win over Ukip voters who believe most jobs created as Britain’s economy recovers are being snapped up by foreigners. Following a complaint by Jonathan Portes, head of the National Institute for Economic & Social Research, Dilnot confirmed that neither the original fear that migrants were taking British jobs nor the reversal of this trend were supported by official data. Employment data collected by the Office for National Statistics relates to jobs in the economy whether or not they are newly created by employers. Dilnot said the relevant figures from the ONS showed the number of migrants in the labour force increased by 400,000 over the last five years, an 18% rise, while the number of UK nationals increased by 3%, or 900,000. Information Commissioner Christopher Graham launched a scathing rebuke of the decision to exercise the Government’s veto in a report on the case to Parliament. Blocking the publication of a report into the risks of NHS reforms is a sign that ministers want to downgrade freedom of information laws, a watchdog has warned. Health Secretary Andrew Lansley deployed it to block an Information Tribunal ruling that he should meet Labour demands to disclose the document. However, the figures cited also included single mothers, people who were seriously ill, and people awaiting testing. Iain Duncan Smith Rebuked Over Immigration Statistics – Iain Duncan Smith and the Department of Work and Pensions have been accused of publishing misleading immigration figures that were “highly vulnerable to misinterpretation”. Figures showing 371,000 immigrants were on benefits were rushed out by ministers with insufficient regard for “weaknesses” in the data, according to the UK Statistics Authority. In a strongly-worded rebuke to Work and Pensions Secretary Iain Duncan Smith, the head of the UKSA, Sir Michael Scholar, condemned the handling of the research, the Press Association reported. Sir Michael said that despite being “highly vulnerable to misinterpretation”, the claims were given to the media without the safeguards demanded for official statistics and by issuing the figures as a “research paper”, the DWP had bypassed the need to meet the usual code of conduct, he noted. Grant Shapps rebuked by UK Statistics Authority for misrepresenting benefit figures – Yet another Conservative politician is caught making it up. Grant Shapps has joined his fellow Conservatives in the data hall of shame. In March, the Tory chairman claimed that “nearly a million people” (878,300) on incapacity benefit had dropped their claims, rather than face a new medical assessment for its successor, the employment and support allowance. The figures, he said, “demonstrate how the welfare system was broken under Labour and why our reforms are so important”. The claim was faithfully reported by the Sunday Telegraph but as the UK Statistics Authority has now confirmed in its response to Labour MP Sheila Gilmore (see below), it was entirely fabricated. In his letter to Shapps and Iain Duncan Smith, UKSA chair Andrew Dilnot writes that the figure conflated “official statistics relating to new claimants of the ESA with official statistics on recipients of the incapacity benefit (IB) who are being migrated across to the ESA”. Of the 603,600 incapacity benefit claimants referred for reassessment as part of the introduction of the ESA between March 2011 and May 2012, just 19,700 (somewhat short of Shapps’s “nearly a million) abandoned their claims prior to a work capability assessment in the period to May 2012. The figure of 878,300 refers to the total of new claims for the ESA closed before medical assessment from October 2008 to May 2012. Thus, Shapps’s suggestion that the 878,300 were pre-existing claimants, who would rather lose their benefits than be exposed as “scroungers”, was entirely wrong. As significantly, there is no evidence that those who abandoned their claims did so for the reasons ascribed by Shapps. The chair of the UK Statistics Authority has rebuked shadow home secretary Chris Grayling – the authority have said he “must take issue” with claims made by the Conservatives and warned the way they use violent crime statistics is “likely to mislead the public” and damage public trust. Mr Grayling has used a comparison between figures to suggest that the Labour government has presided over a runaway rise in violent crime. Speculation data was leaking into the market ahead of the Office for National Statistics (ONS) announcement has been rife. Market rumours correctly predicted the last two Consumer Price Index inflation releases just before publication – in April and May. UK Statistics rebukes Government over NHS spending claims – David Cameron famously promised he would cut the deficit, not the NHS. We now have it in black and white: he is cutting the NHS, not the deficit. There could be no clearer evidence of the failure of this Prime Minister and his Government. “For months, David Cameron’s Government have made misleading boasts about NHS spending, misrepresenting the true financial difficulties he has brought upon the NHS. At the same time they have recently begun to try to distance themselves from these problems which David Cameron has created, trying to shift the blame to the NHS and its staff” – Andy Burnham. The watchdog has called on ministers to correct claims the coalition has made that they increased NHS spending in England. The UK Statistics Authority upheld a complaint by Labour about government claims the NHS budget had increased in real-terms in the past two years. The watchdog found that the best-available Treasury data suggested real-terms health spending was lower in 2011-12 than in 2009-10. The Coalition said during its spending review that the NHS budget had gone up. 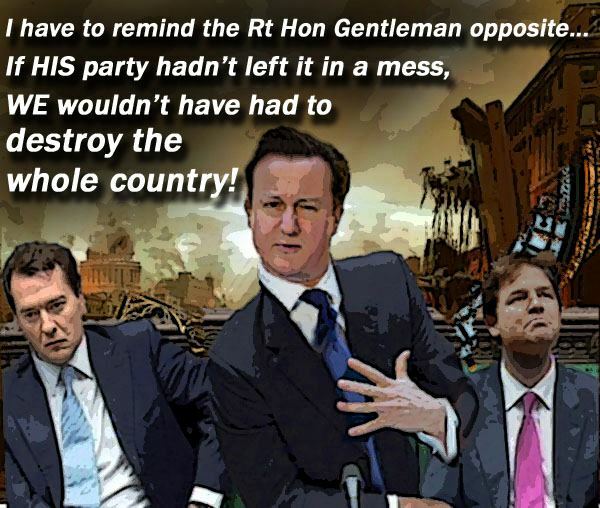 Coalition rebuked again by UK Statistics Authority – this time on flood defence spending. Andrew Dilnot says a Treasury graph on infrastructure left readers with “a false impression of the relative size of investment between sectors”. George Osborne and the Treasury have been reprimanded for misleading people about the government’s investment in infrastructure. For example, their chart made it look like investment in flood defences was roughly the same as in other areas, when in fact it was a tiny fraction. Andrew Dilnot rebukes Treasury again over the false presentation of statistics in the National Infrastructure Plan. The UK Statistics Authority has censured the Department for Education – Sir Michael Wilshaw – appointed by Mr Gove as Ofsted chief inspector – for using uncertain, weak and “problematic” statistics to claim that England’s schools have tumbled down the global rankings – the central justification for Goves’ sweeping school reforms. But now the government’s own statistics watchdog has called into question the figures at the heart of the education secretary’s argument. His verdict is a blow to Mr Gove’s claim that England has “plummeted in the world rankings” given that the education secretary has been so unequivocal about the figures, arguing that “these are facts from which we cannot hide”. Senior Conservative ministers have been rebuked for attempting to cover up Government statistics – showing one of their key housing policies is not working. In his ruling, seen by the Independent, the Information Commissioner roundly rejected the argument put forward by DCLG officials and demanded that the information be released. He ordered that the information is to be released. And what did it show? In a short table released to the Labour Party, it showed that the number of people who begin self-build homes had fallen since the depths of the recession in 2009 under Labour from 11,800 to 10,400 in 2011. Theresa May rebuked over illegally deported asylum seeker – A rare court order calls on the home secretary to find and bring back a Turkish national and investigate UK Border Agency conduct. The home secretary has returned to the high court and asked Mr Justice Lloyd Jones to set aside the order. The request was rejected and May now has to ensure the man is brought back to the UK. It is rare for orders to be granted by the court calling for people who have been forcibly removed from the UK to be returned and even rarer for the home secretary not to comply with them. Mr Justice Singh stated that he was “very concerned” the government had failed to comply with his order. Watchdog reprimands Eric Pickles’ department for £217m overdraft – The National Audit Office finding is embarrassing for the communities secretary, who was praised by chancellor as a ‘model of lean government’ – for his ability to impose cuts on struggling councils – he has been reprimanded by the Whitehall spending watchdog for running up an unauthorised departmental overdraft of £217m, the NAO disclosed that the Treasury had imposed a £20,000 fine on his department as a punishment for its poor financial management. The head of the civil service officially reprimanded David Cameron over the behaviour of his special advisers – following ‘unacceptable’ briefings to journalists, PR Week has learned. Sir Gus O’Donnell was so alarmed at briefings coming out of Government that he wrote a strongly worded letter to the Prime Minister urging him to restrain his aides. Prime Minister is rebuked over Liam Fox inquiry, for failing to call in his independent adviser to look at claims that the ministerial code had been breached. Fox resigned after being found guilty of breaching the code in his relations with lobbyist Mr Werritty. MPs also claim the advisory role itself “lacks independence” after a new candidate was appointed behind closed doors by Mr Cameron. Office of National Statistics rebukes David Cameron because of his false claim that average waiting time in Accident & Emergency has fallen. Andrew Dilnot rebukes Cameron regarding the false claim that most new jobs in Britain used to go to foreign workers but now go to British workers. David Cameron rebuked AGAIN by the Office of National Statistics for the false claim that Britain is “paying down its debts”. The Prime Minister said Britain had been “paying down its debts” during the Tory party conference, Sir Andrew Dilnot, pointed out that, while the deficit has fallen since the Coalition came to power in 2010, debt has risen. And he noted that he had already rebuked Mr Cameron for making the same claim in a party political broadcast in 2013. The committee’s reproach is a blow to Osborne before the general election, when the Tories are expected to come under fire from Eurosceptics inside the party and from Ukip over the size of the UK’s EU contribution. Further evidence – UK Statistics Authority correspondence list: complaints and responses regarding Tory lies. Reblogged this on For what it's worth…….by @costofcameron.